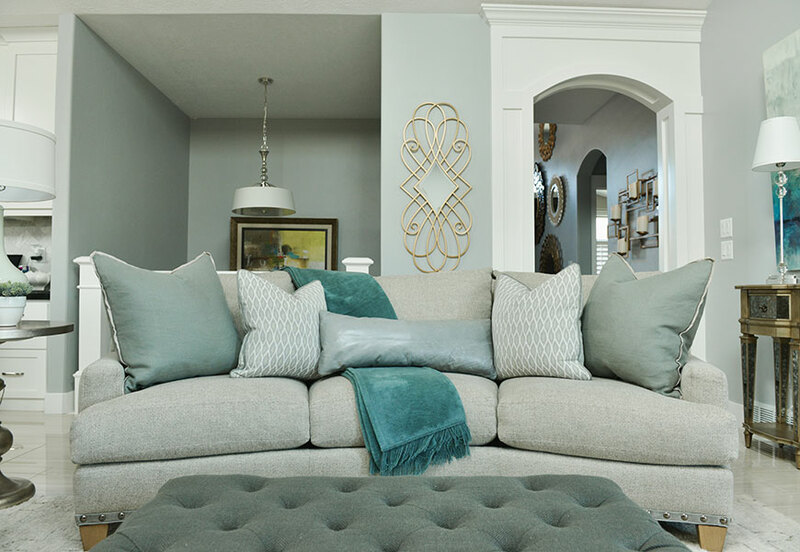 Beautiful and blue, we love this elegant and calming living room space. Designed by Chanelle Anderson of Gatehouse No. 1, this beauty is a great mix of timeless and trendy. 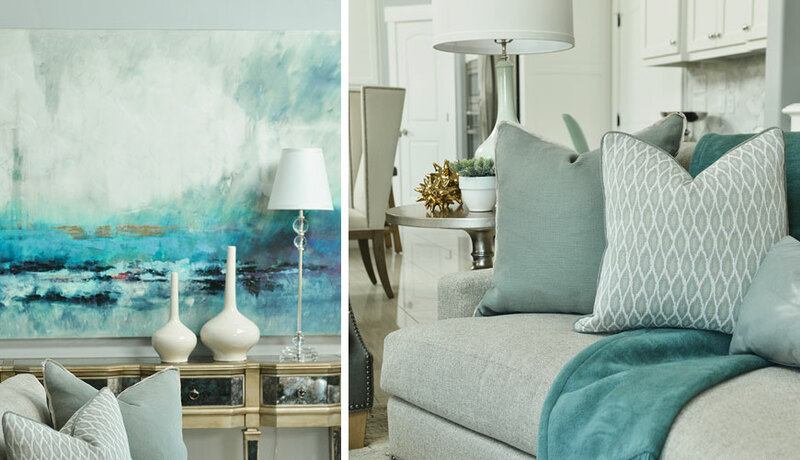 Full of monochromatic furnishings, the space maintains a cool neutral vibe of grays with vivid blue undertones, and is given the occasional and fresh pop of deep turquoise through accessories such as pillows, throw, and artwork. 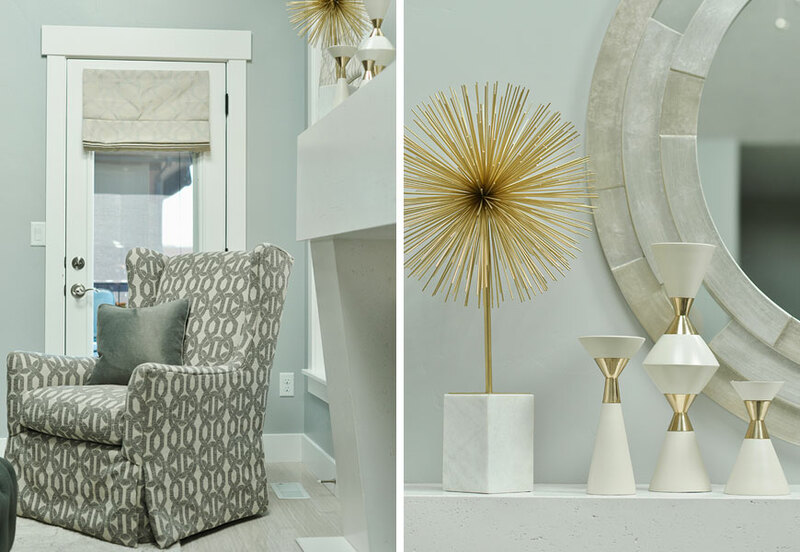 Cool geometric lighting and sculptures in cream and gold hues give this room the final touch of elegance that it needs, and tie the space together. 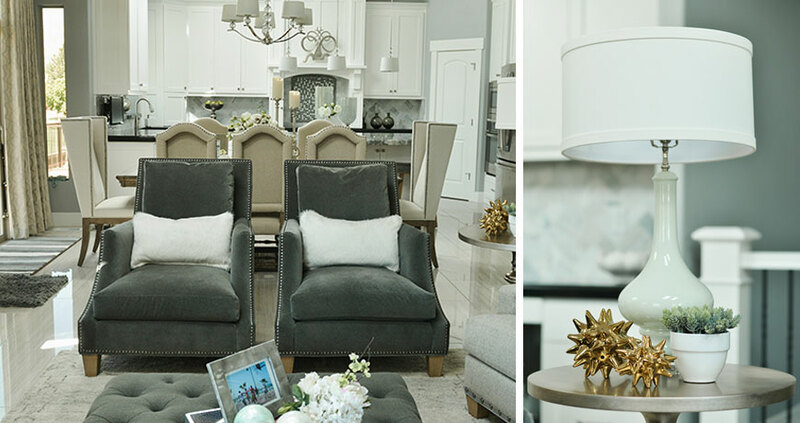 Some of our personal favorites in this design are the pair of nailhead chairs in a rich grey velvet, the oversized tufted cocktail ottoman, and the cream and gold statues on the modern style mantle. 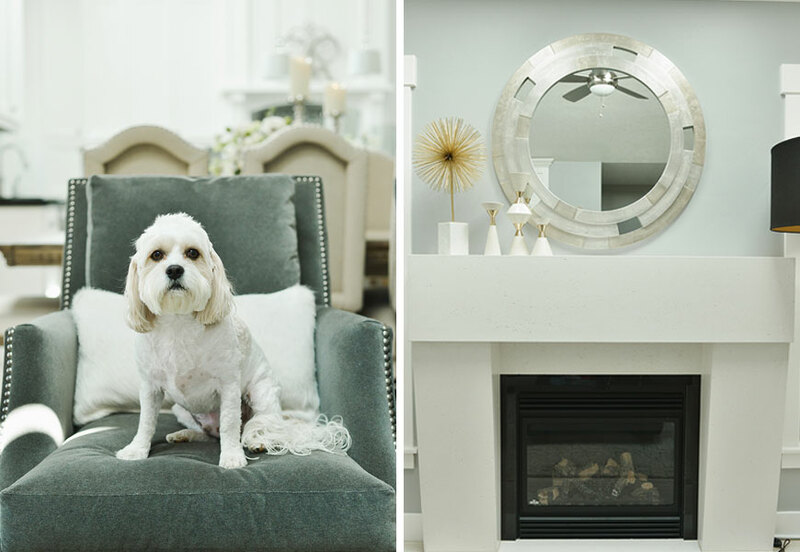 To recreate your own elegant and inviting space similar to this moody blues living room, shop the products seen in the space as well as some of our own inspired picks; cute pup not included! 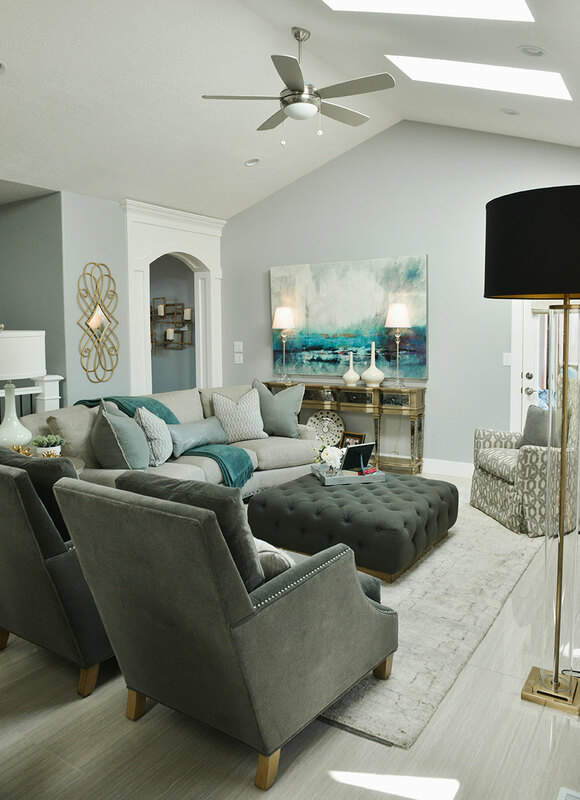 Even though this space is made up entirely of cool tones, it still maintains a warm and inviting feel because of the textures used throughout the space. 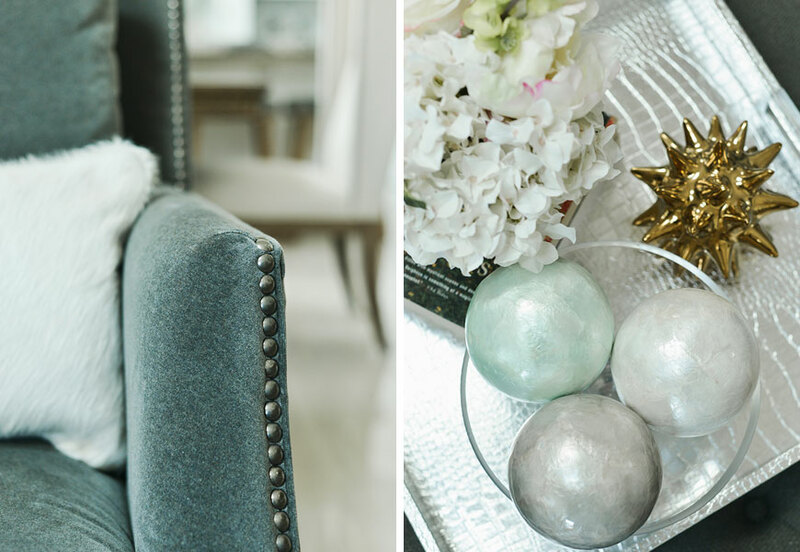 To make a dreary space more inviting, be sure to include items such as knit or fur throw pillows, soft rugs, and inviting fabrics such as velvet. 1. 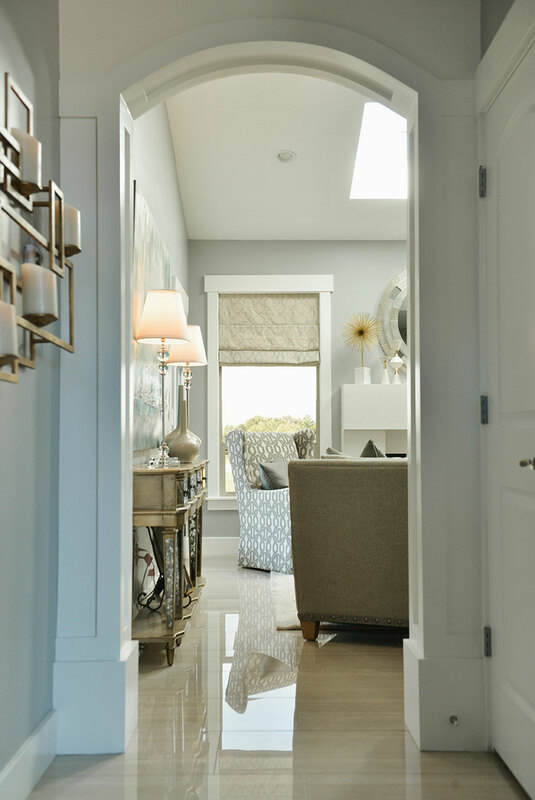 Do you have a favorite design element in this space? My favorite element in this space is all the different textures used, chunky box weaves, soft velvets, leather, hide…the combination of these elements really made this space come together. 2. Were you inspired by anything in particular when dreaming up this design? The modern blue canvas art work in the great room. 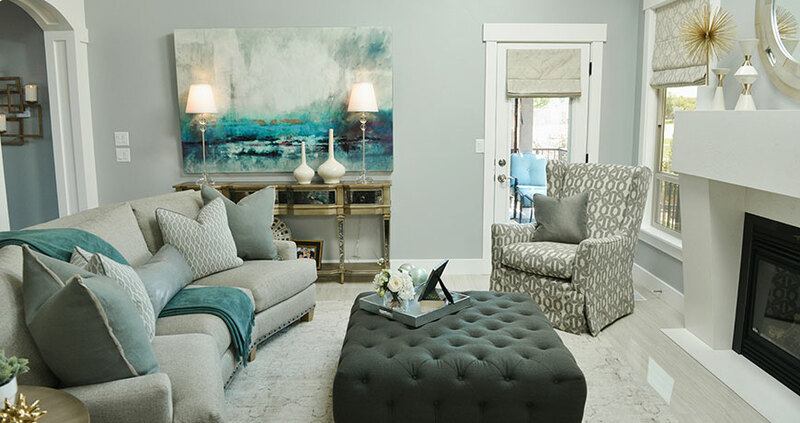 We designed the great room around this artwork, with the idea in mind that our furniture pieces would be a neutral compliment to the bold colors in the art. 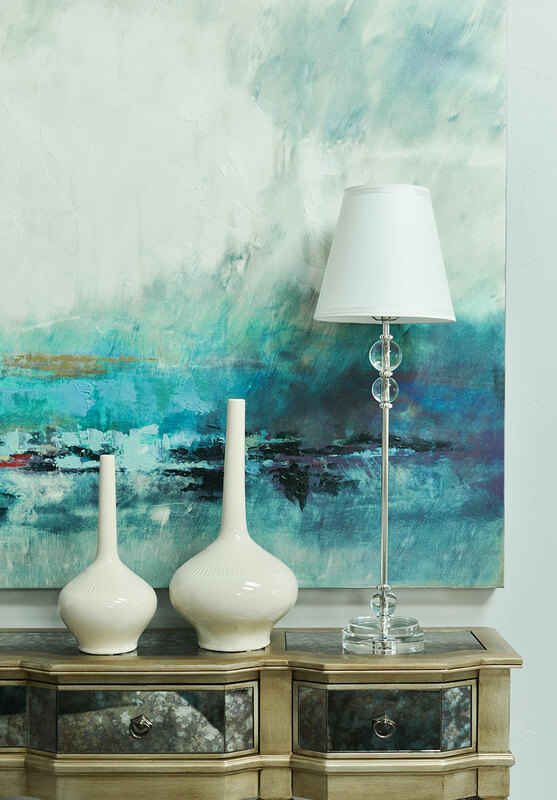 I designed this space after a trip to Hawaii, and this canvas reminded me of snorkeling in Kawaii – beautiful tones of every shade of blue with touches of bright color! 3. Did you encounter any challenges when designing this unique space? This home is a town home and has less square footage than my client’s previous home. We wanted pieces that would fill the space, but fit it as well. 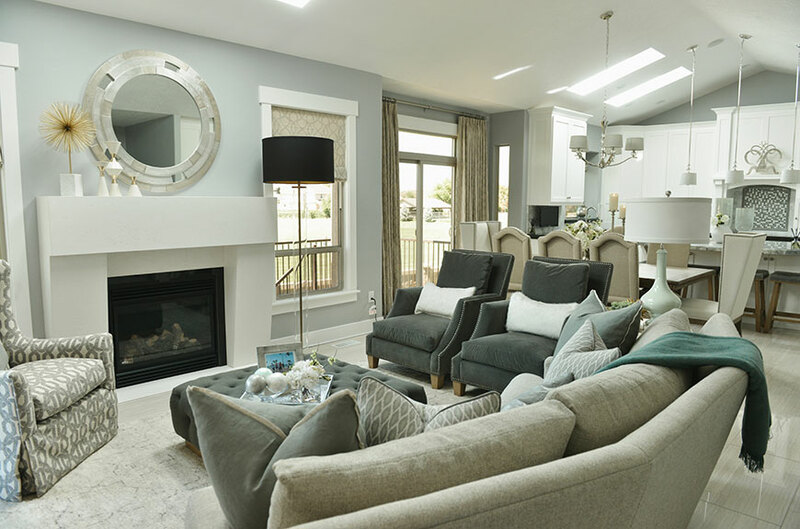 The curved sofa from Lee Industries was the perfect choice because it offered enough seating, but still allowed for an open traffic pattern and made the space still feel very open. 4. Do you have any additional insights that you would like to contribute about the design? Don’t be afraid to think outside the box, or color outside the lines! One of my favorite elements is the office chair up to the desk in the kitchen. What a great spot to add a burst of color, in a space that could have otherwise been overlooked.